Your kids don’t have to be the only people enjoying candy canes this holiday season. 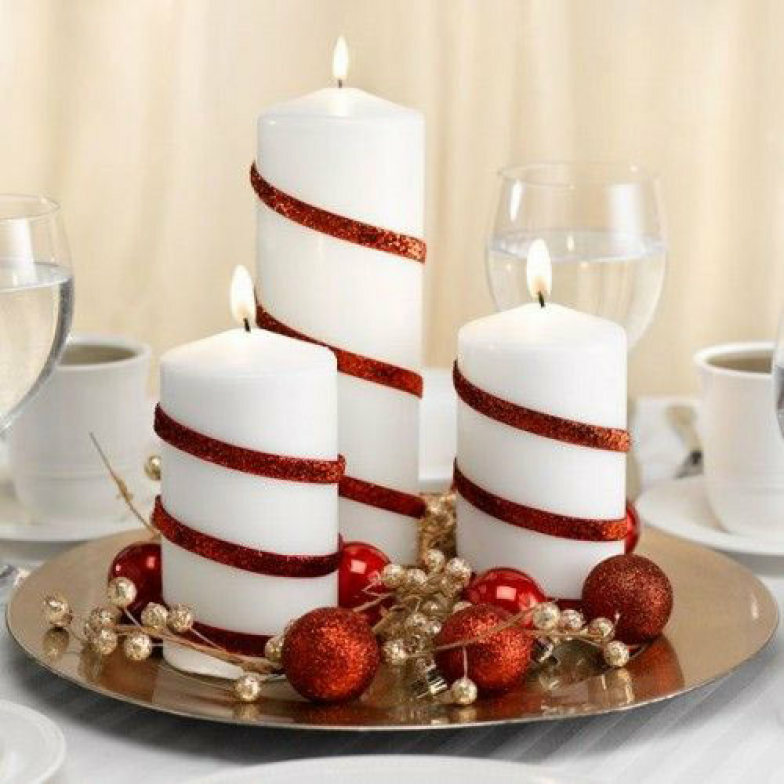 Turn your candles into candy canes by swirling a simple strip of red fabric around them with a simple type of adhesive. Scrapbooking adhesive glue dots or even a hot glue gun will work well here, but stay away from Elmer’s; it won’t adhere to the wax. 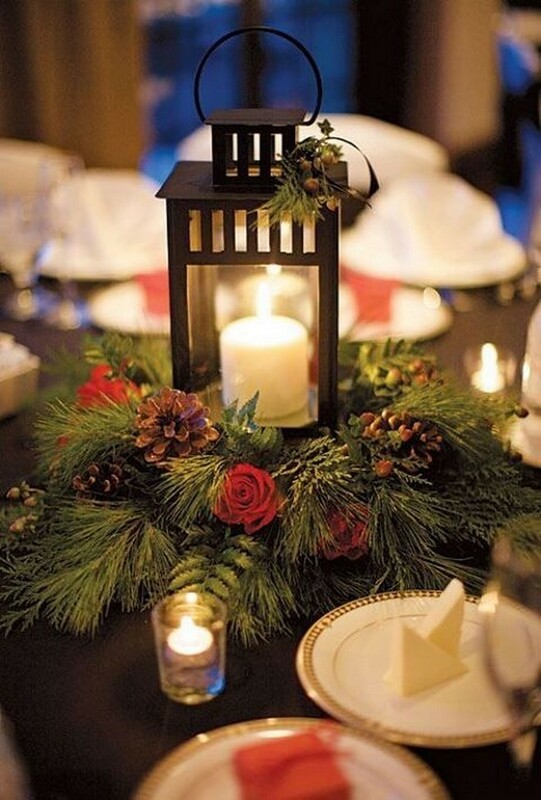 Get something sparkly and red for an added twinkle and use some simple accent pieces, like small ornaments or dried or wax flowers, to fill out the base. Mmm. Your guests will want to pause and inhale deeply around this centerpiece. This DIY Christmas project puts the fresh back into the forest, or perhaps it is more accurate to say that it brings the freshness of the forest to you. This piece will last a week or more if you use floral foam (available at any craft store) and stick little pieces of fresh greens into its base. Floral foam allows you to water the stems and keep them hydrated and healthy for longer. Without floral foam your piece will likely only last 2 or 3 days before it begins to wither. Stop in to your local florist and ask for ferns, pines, holly and other types of deep, dark greens. 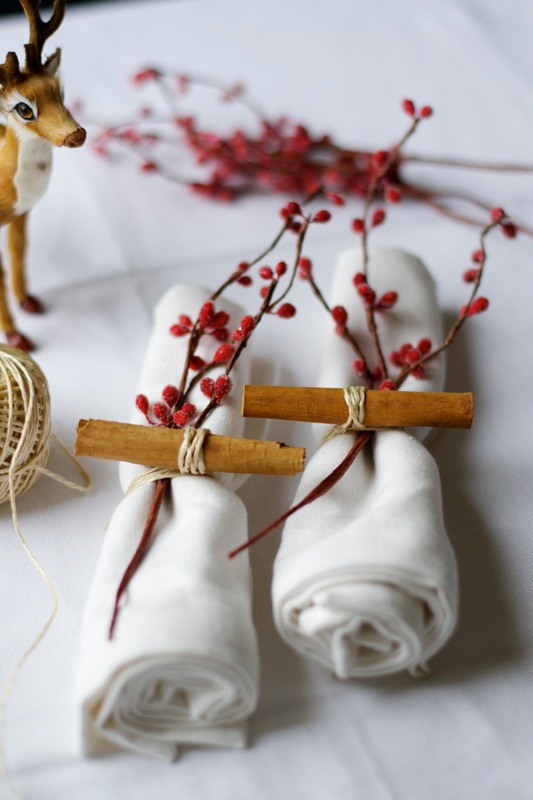 Tieing in a cinnamon stick to this simple white cloth napkin is a festive way to spice up your table settings (quite literally!) Use a strand of rustic twine to add texture to your napkin and table setting, and garnish the cloth napkin with a sprig of fresh cranberries or dried berries to add some color and contrast. This DIY project is proof that you don’t need a whole lot of time or money to make the little details speak volumes and stand for themselves. If you’re inviting guests, consider adding a cinnamon stick recipe for German mulled wine or cinnamon sugar cookies so that the napkin doubles in purpose and also serves as a “take away” gift and table favor. This Christmas table decoration has a lot going for it. A simple monotone color scheme sets the theme into motion and animates the white plates around it. Everything is red, red, red and Christmas is here with this candied display. 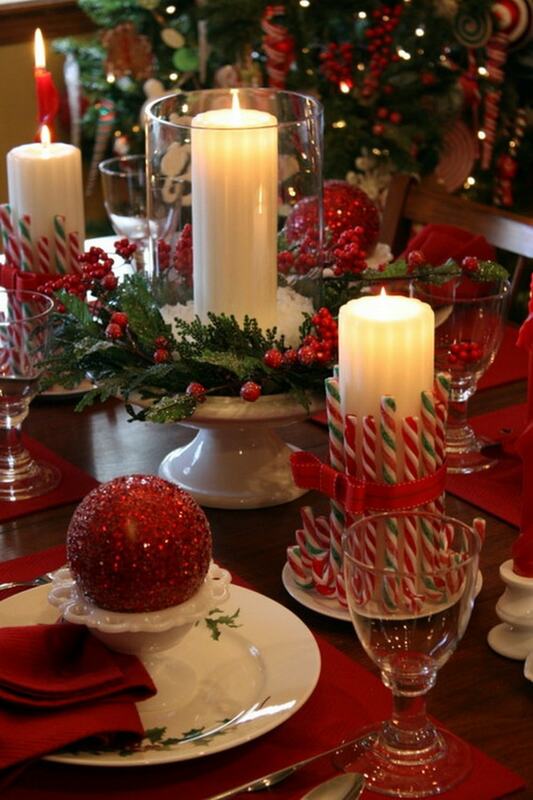 Candy canes turned upside down create a playfulness and a lightness while adding a touch of holiday cheer. 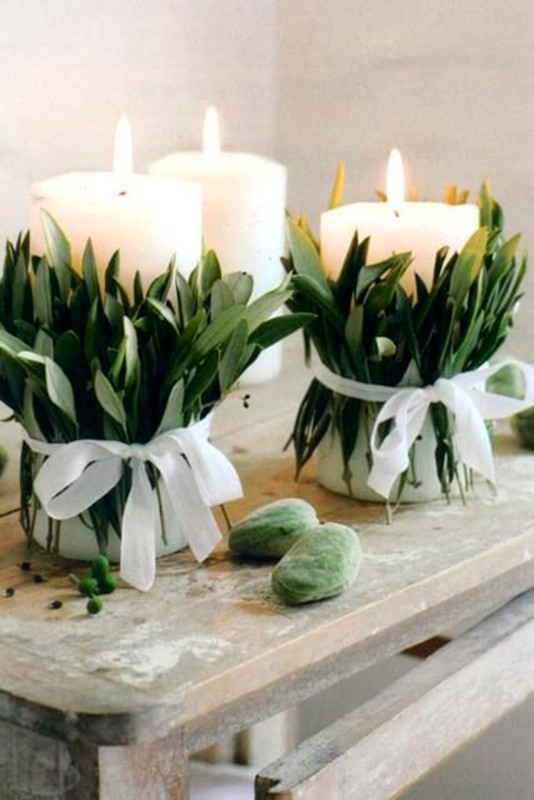 Tie it together with a bright and playful ribbon and allow the focus to be drawn to a lushly fresh and bright green wreath which will decorate the center of the table. Once the table is set we know that you’ll have a lot of people wanting to sit around it and the glasses will be ready to be filled. Enjoy! 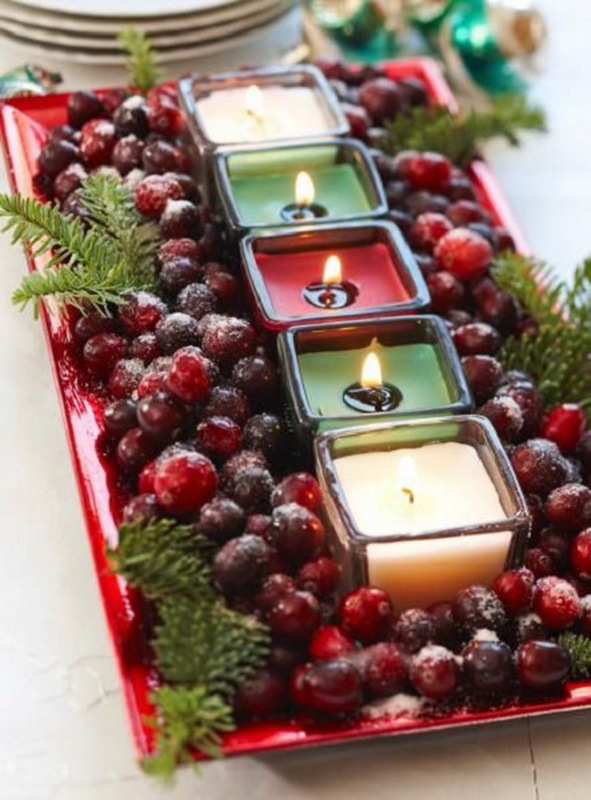 Tiny little green, red and cream colored tea lights, fresh red and purple cranberries and a few sprigs of your favorite green creates a bright and cheery ambiance and a festive Christmas table decoration. Plating the cranberries on something red draws an even deeper attention to the richness and freshness of what’s on the plate. This table decoration is small enough to decorate the food, dessert or punch table or works well as a coffee table Christmas decor. These funky place card holders are a great way to put some sparkle on the table. 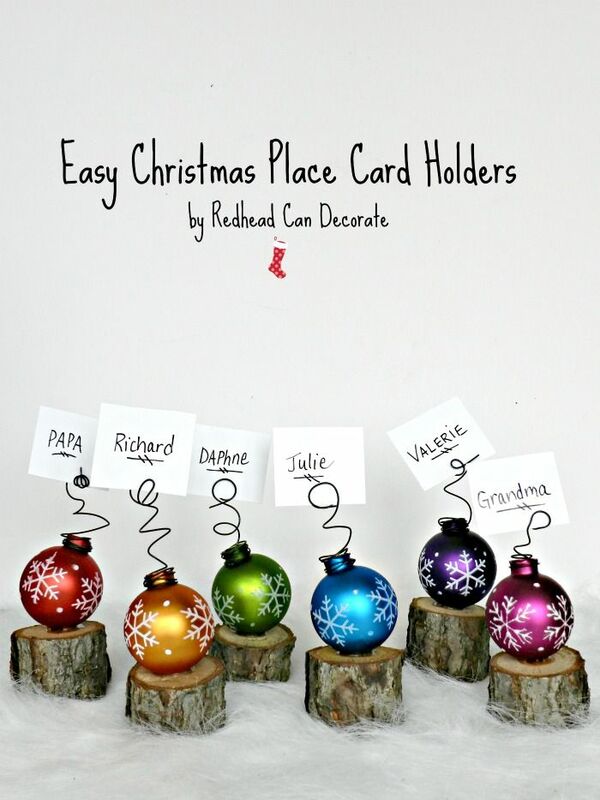 This is a super fun and simple DIY Christmas idea. Buy a quirky and unique set of ornaments that complement each other yet still remain unique. Twist up the wiry ends with a pencil to create a fun spiral that leads up to the personalized (and hopefully handwritten!) name tag holder and glue the bulbs onto a small block of wood for stability. These fun Christmas colors will brighten up those dark and cold winter nights and light up the faces of your guests for sure. Live in a tiny flat in the middle of a big urban city so you’re short on space for your Christmas tree? 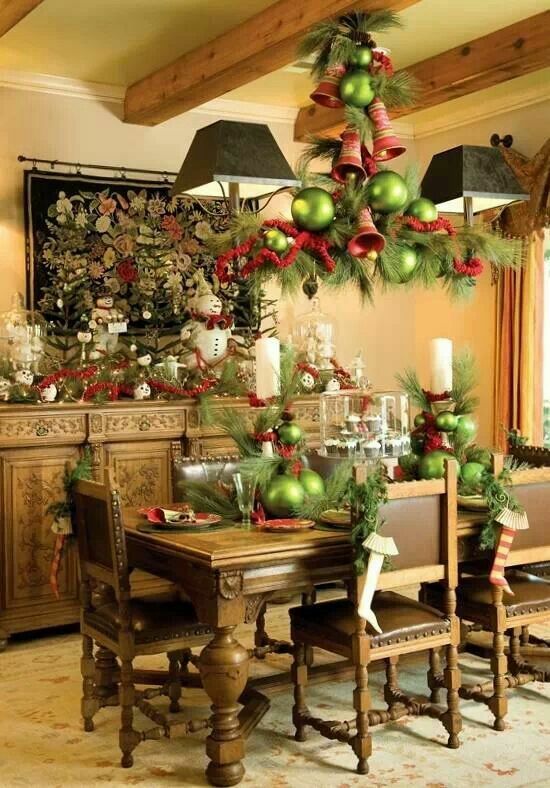 Move it to the table and create a two for one effect: Christmas tree and Christmas table decoration. Keep it simple, though; you won’t need all of those fluffy branches and leaves. Set out to find a few branches and deck their limbs in everything golden and glimmery. 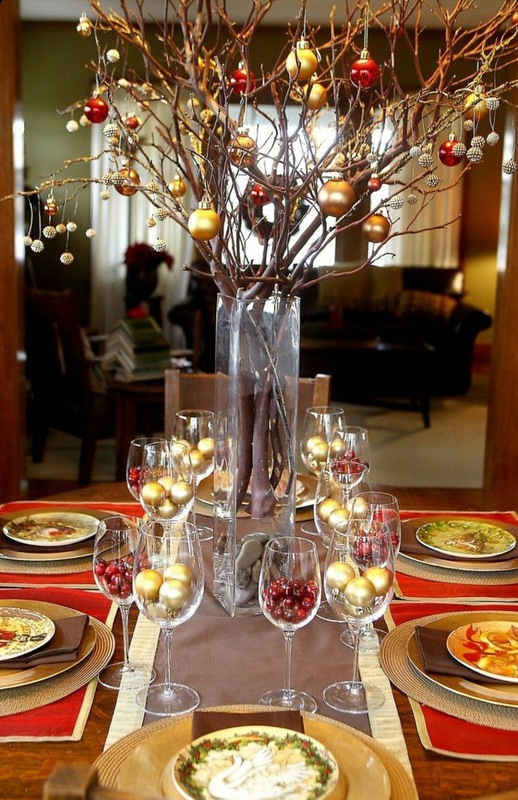 Adding some fresh cranberries to the base of the vase is always a great way to bring the Christmas colors onto the table in a natural way. Big green balls, red Christmas bells and everything fresh and green in between. This nostalgic Christmas decor will take you back to your childhood days when you built snowmen in the backyard and made wish lists for Santa. In fact, in a world where the North Pole really does exist, we imagine it looks something like this. Bring Christmas to your table with these kid-friendly decorations and watch the sparkles in their eyes glimmer. With decorations hanging above you and a table full of decor sitting beneath you, you’ll all set for a holiday season of jingle all the way.